The Gorkha Janmukti Morcha today desperately tried to nullify the advantage that the hill Trinamul had received from Mamata Banerjee's announcement that a land survey would be conducted for residents of Mirik municipality. The Morcha that questioned the need for the survey, however, said it would be a good move for the hill people. Roshan Giri, the general secretary of the Morcha, today said: "The announcement is good as it is our own people who will get land rights. However, we have apprehensions that it might just be a political stunt before civic elections. Survey of Mirik municipality area was done in 2011 by the Left Front government and if the government is sincere, it should immediately distribute land rights." Official sources admitted that such a survey had been conducted. Giri's statement is an indicator that the Morcha is desperately trying to nullify the impact of Mamata's announcement. While announcing the upgrade of Mirik block to a subdivision yesterday, Mamata had said: "We will conduct a survey to address the land problem that you have in Mirik town. The survey is needed as we will have to get a clear picture, find out who has what, a shop or a residential house. After the survey, we will take an official decision so that you get an address of your own. We will find out a solution to your problem," Mamata said. Mirik municipality has nine wards and residents of only wards 4 and 5 have land rights. The rest of the land belongs to Thurbo tea garden. Giri today raised another point. "The government is presently distributing land rights among people in the plains but the ceiling is five decimals. However, people of Mirik have land more than that ceiling. The government must give deeds for the entire land that is under a resident's possession and there should be no salami," said Giri. Under the state government's land distribution policy, landless people are given five decimals of land to construct a house. The Morcha iterated that all tea garden and cinchona plantation residents in the hills must be given land rights. "We demand land rights for the residents of tea gardens and cinchona plantations," said Giri. 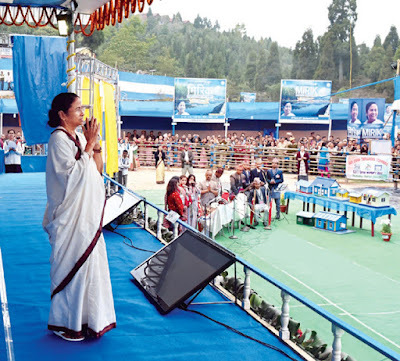 The Trinamul (hills) today tried to cash in on Mamata's announcement yesterday and said the party was a bridge between the hill people and the government. "The hill Trinamul is a bridge between the people and the government now. The state government has made the land announcement after we aired people's grievances before the government. Earlier, too, the state government had released appointment letters to 300-odd voluntary teachers after we took up their cause," said N.B. Khawash, the working president of hill Trinamul. .